Southeastern, GA: Alligators, turtles, white-tailed deer, raccoons, pileated woodpeckers, resident water fowl, water lilies, swamp grasses and miles and miles of quiet, deep, dark-black brackish water in a wonderfully quiet remote natural area. In the dark water, deep in the swamp, an alligator is a pretty scary creature. 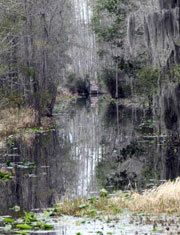 A wild, woolly, alligator infested swamp, a-way-out in a vast section of Georgia; that is the Okefenokee National Wildlife Refuge and Management Area. The swamp itself accessible mostly by small boats, canoes, kayaks (depends how close you want to get to them gators; an inner tube, for instance, might leave you bottomless). Pulling Luciee, my little trailer, I entered the refuge from the southwest, north from Interstate 10 in Florida camping several nights, first, in the historic little community of White Springs, Florida on the Suwannee River. As many of you may know the Suwannee River is the real name for the famous SWANEE River of Stephen Foster’s song, but Foster didn’t need the extra syllable in su-wan-nee, so he changed it to Swan-nee (artistic license :o)- The Suwannee River head-waters in the Okefenokee Swamp and flows zig-zag clear across Florida to the Gulf of Mexico. From White Springs it is about an hour or so drive to the central campground called Stephen C. Foster State Park in Okefenokee Swamp. Not to be confused with Florida’s Stephen Foster State Park in White Springs, Florida, nor with GA’s Okefenokee State Park in Fargo. Good grief. Toothy Resident Okefenokee Marina Pond about 9 feet in length. The sense of the remoteness of the swamp slowly invades your brain as you drive through the miles and miles of farmland and swampland that is the landscape after leaving White Springs. Hardly a car passes by. Mean-looking, log-loaded logging trucks pass us doing 75 or 80 mph on the two lane roads. I heard from a local that those log-rescue guys on the Discovery Channel that pull logs from under swampy waters and make big money selling the wood, are in town. Their operation, like a well-oiled machine, takes good advantage of all the local businesses bringing much needed income to the community. Along the way, a road-kill deer has two golden eagles scavenging while the vultures stand by looking robbed. They all fly off as I stop about 75 or 100 feet away. I LOVE PIGS and pigfarms! pigs. They are smart, playful, curious, mischievous, pushy and the big ones are very strong. Pigs are very susceptible to sunburn, hence the Quonset huts for cooling shade; it gets very, very hot in this part of the world. New growth pine timber for harvest. 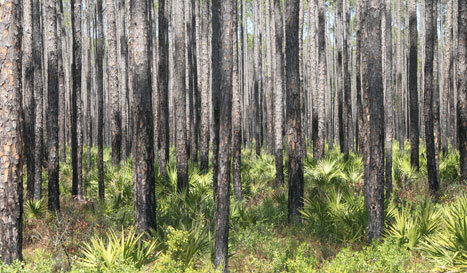 large tracts of new growth trees that show the signs of controlled burning keeping underbrush low. Here and there are the presence of deer, even in daylight, and a plethora of birds of great variety, from warblers and vireos to egrets, raptors, great blue heron, ibises and woodpeckers. The park management has very strict rules about feeding the wildlife or making contact. Folks who ignore them (at their own peril) are subject to citations and fines. But it is not all unhappy; the rangers are well-versed, offering good park lore and giving good friendly advice. Two Rules apply while exploring the swamp by boat— Rule One: Don’t get out of the boat; Rule Two: Don’t get out of the boat. There are miles of waterways to view in rental boats or on guided pontoon boat tours and many folks bring in their own canoes, as well. Outboards, are limited to 10 hp, I believe. If one takes the time of just walking around the swamp marina, which is the size of an average pond, there are wonderful animals to see right off, including the resident alligator, a huge soft-shelled turtle, many other common turtles, frogs, small fish and, of course, the comings and goings of many feathered friends. The waterways are open to travel and it is pretty hard to get lost, but you can do it. There is a rescue team boat nearby and, I suppose, a rescue team, but the team is not evident so not too much concern. If you bring your pet, be aware that it cannot go with you in a boat and there are rules about leaving your pet unattended in your car or camper. Of course there is the constant danger of letting your small dog get too close to the water’s edge. The alligators can run as fast as a buffalo and they love small, crunchy morsels. BEWARE. 9 feet of wild, hungry, quick as a buffalo; unstoppable as a train. There are two interpretive trails. 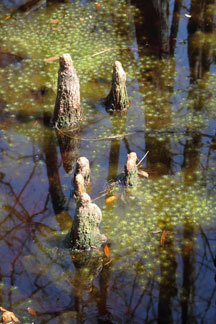 One has a semi-boardwalk through the swamp built 4 or 5 feet high off the water. Holding my 12 lb. alligator bait, Minna, in close check I was quite comfortable walking her as it winds through a half mile of swamp. The other proceeds through about a mile of hardwood and pine forest, some of it at this time impassable due to high water. As dusk settles in, I walk the boardwalk, the swamp is rife with quiet; just the breeze through the leaves, a bullfrog lullaby, fluttering and chirping of small birds, a woodpecker knocking, and an occasional owl hoot. No din. No jets. Not a voice to be heard. Peering down into the dark briny water, the color of fallen leaves paints the picture of last fall’s color; water spiders churn up the surface. An occasional loud splash of an animal retreating as you approach and signs warning “A FED BEAR is a DEAD BEAR” keep one remarkably alert. 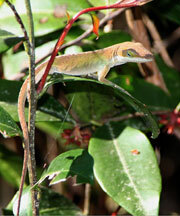 A "not-so-green" green anole is not a true chameleon. The rest of the story is for you to discover. 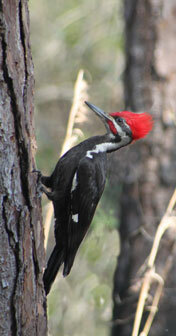 Okefenokee Swamp is a wonderful place, like so many wild places in America. It’s practically free and what a journey to remember. Below are more of my photographs. Early spring water lily leaf awaits the blossoms. 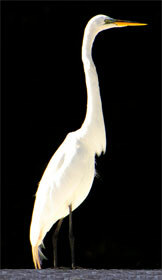 The magnificent, dignified head of a great egret. This place looks great (thanks to your super photos.) That’s some intense looking gator you captured there! Glad your little dog made it out in one piece. Wonder if there are a lot of mosquitoes in the summer? Thanks for taking us on a bug-free visit. Pigs get sunburn! Never knew that. Leave it to you to share some surprising tidbits with us. What a mesmerizing walk through the Okeefenokee. My attention was focused on so many wonderful pictures as if I was looking at them myself. I felt like I was there. For a short time all the world around me stopped and I travelled along on this wonderful journey. i just enjoyed a wonderful escape! your words and pictures are incredible. thank you Bill…glad you and Minna made it out alive! Hi Bill – its Jim from Canada. Met you at Stephen Foster the day before you left. Great photos and loved the story of the dummy and the Gator. How are the plans going for Central America. Good luck along the way. Will check back regularly. Take care!! !